Home › Resources › Articles › Robotics is a GO, now what? 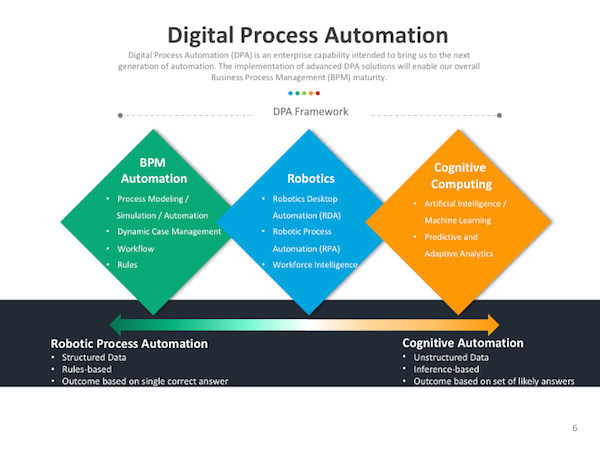 Many companies are making the decision to step forward and implement various forms of Digital Process Automation, namely some version of Robotics Process Automation (RPA). There is a spectrum of Automation (Exhibit 1), from simple tasks that “bots” can easily handle to Artificial Intelligence. RPA is the next generation of process automation, moving from scripts and macros, to automating repetitive activities. Companies are choosing where to jump in and how to stand up to the new business capability. What is exciting business leaders, is the view of the “art of the possible” coupled with the short timeframes to implement. Many of the simple to medium complex “bots” can be developed, tested and implemented on average, in 8-10 weeks, with initial implementation of the capability running in parallel. Most approaches to implementation, are built on a foundation of Business Process Management and implemented through Agile methodologies. To remain relevant in the market and meet increasing consumer demands, businesses must embrace a digital everywhere strategy. These new digital solutions are enabling business agility to respond to changing market conditions and transformational changes to business processes to increase operational efficiency and lower costs. To fully realize the value created by implementing digital solutions, businesses must first deepen their understanding of end to end processes and associated process performance. Business Process Management, coupled with Digital Process Automation is beginning to be a winning combination. Business Process Management is the discipline that enables businesses to cut across their vertical functions (divisions/departments), understand their supply chains and focus on outcomes of their Value Streams. For companies that deploy a Business Process Management framework, they most likely have some form of an Enterprise Center of Excellence. Below is the construct of a governance model that is integrated with our broader BPM Governance. This allows for integrated connection to our Value Stream management. (Exhibit 2). 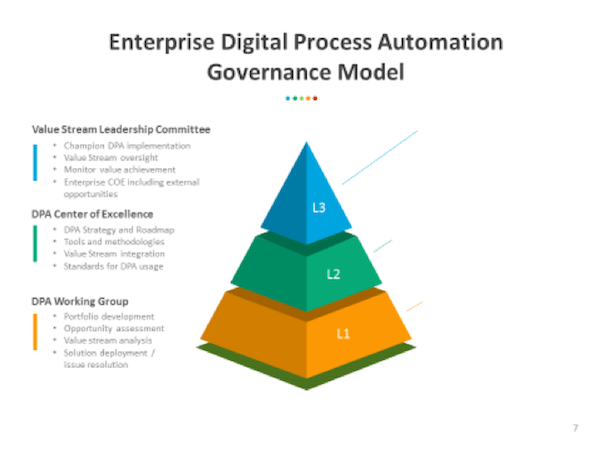 When bringing in Digital Process Automation, snapping into an existing enterprise coalition of senior leadership helps further guide the digital process improvement opportunities working closely with the business process teams in process improvements. 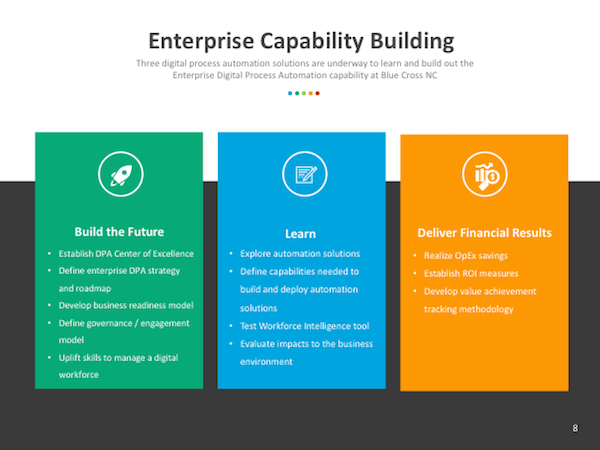 To gain the full value of Digital Process Automation tools, an Enterprise Center of Excellence is foundational to launch this new Business Capability, to include an enterprise “digital assessment” to provide a top down view and encourage an enterprise approach, ensuring you do not introduce a silo’d solution . You will end up with a strategy and foundation for prioritization, that will increase your ability to gain value quickly and in a sustainable way. The value of digital process automation tools, is best unlocked when thought of as Business Capability led, enabled by technology. Cross-functional collaboration is a key to success and can be realized by creating teams that are staffed with experts from the business areas, business process team and IT. The teams should be empowered to experiment and think broadly about potential applications for robotics, to imagine new possibilities for transformational change. 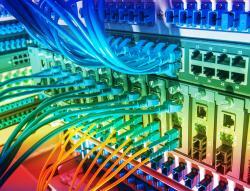 They can harness the tools and drive better solutions more nimbly and quickly. In addition, deploying a team that works across all the delivery teams and integrates for end to end Digital Process Automation, then builds to the more complex value stream enablement. This then drives even higher value return, as you are then optimizing across the enterprise process. 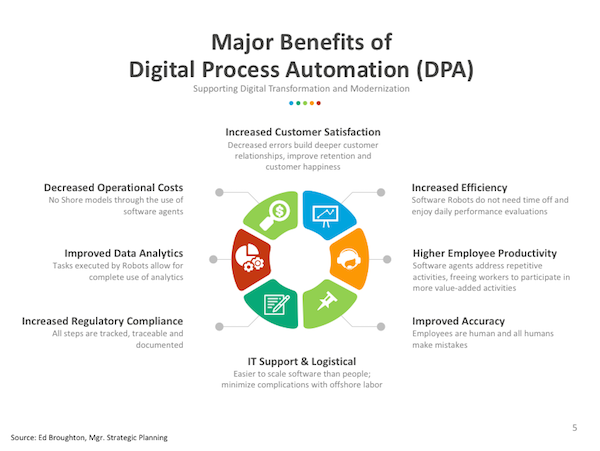 Below in Exhibit 3, are benefits that can be unlocked when Digital Process Automation is implemented as an Enterprise business capability vs. just within a single division. When standing up this new capability, teaming and culture cannot be overlooked or taken lightly. As Spenser Jordon so wonderfully laid out in his book “Who Moved my Cheese”, there will be a lot of “cheese being moved” and teams will be very uncomfortable at first with experimenting and failing forward. This is where it is critical that leadership stay involved helping the teams as they are learning, and coaching them through the different ways in which we will be working. Celebrating little wins on the way to the big wins can help build positive momentum. Agile constructs do help, but that is another area of learning and growing. For a newly forming team, newly forming capability and newly forming pace/cadence…to have to learn another new thing can be overwhelming to them. Team members will be working in areas that are non-conventional to their other work, and there is not a clear delineation of task based roles, as everyone is bringing their best skills and abilities to the table, and learning within a framework of roles. Discussing and aligning the approach upfront is important so the team feels unity, vs. confusion on who is doing what, and how do we get to there. Communicating to the team, the user community and leadership is a critical step. This will be another area of “moving peoples cheese” as there will be differing opinions on what the end user impact will be, and how it will impact the employees. In the journey that my company is undertaking, we approached it by being transparent, communicating that we were deploying our robotic processes as assistants to our users and also giving the first few names, to signal that they are a “Digital Workforce”. We even announced to our Senior Leadership that our first digital worker, “Peggy” was joining the team, on the robots first day. We are also using the phrase coined by other companies “We are taking the robot out of the human”. In addition, we have also looked to find engaging and fun ways for the user community to learn about the new capability, and so far the employees have been excited that we are using these more modern tools. Rolling out Digital Process Automation, is about building an Enterprise Capability that will drive business agility, business value and most importantly Customers and Employee satisfaction. It is work that needs to be approached from an enterprise lens, through an enterprise community and also with a focused and positive program leadership team. Tying into a governance structure that already exists can help with quick alignment and clear leadership direction. Pay attention to the behaviors and attitudes you want to build; like innovation, empowerment and collaborative problem solving and be ever mindful and vigilant to ensure you get those behaviors seeded in from the beginning. Celebrate the small wins, the early learnings (failures) and embrace a culture of learning. And for me, most importantly, is to have fun.